Hao Stars companies from the venture has paid great attention to scientific and technological innovation in equipment. Combination of their own technological superiority and market customer demand, to create a simple and easy to use and rugged durability of the WRL-D series of kettle bottom type emulsifier, SRH series of pipelined homogeneous emulsifying machine (pump), WRL series of intermittent emulsifying machine, mixer THJ Series, SSJM series colloidal colloid mill (Vertical Colloid Mill, Colloid Mill split, Horizontal Colloid Mill, Colloid Mill closed, pipeline-type colloidal) Series, GMC series of multi-functional grinding machine, automatic suction powder dispersed emulsion mixer SSC series, JM series of titanium dioxide grinding machine, JB series of titanium dioxide slurry pump (colloid pumps), ZB series of rotor pump, GS series of single screw pump, automatic tank washing device, fixed, rotary cleaning ball and sanitary valve pipe fittings and other products. The leading product quality and superior performance excellence, have long enjoyed high reputation, reasonable price and won the favor of customers at home and abroad. Already have a utility model, appearance, a number of Chinese patent technology and new inventions, the unique structure is a national initiative, utility models, novel appearance, environmental protection and energy saving, small size, high efficiency, quick delivery and reasonable price, etc., to make your system more reliable, more quiet, less power consumption. 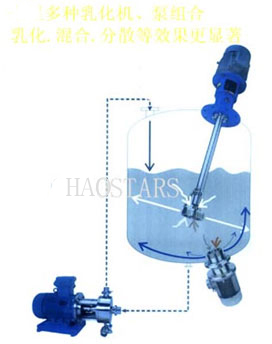 Hao Stars Kettle Bottom-emulsifier (hereinafter referred to: cauldron at the end of emulsifier) the principal features of the operation, the emulsifier produced ultra-high-speed rotation of the vortex reactor at the end of the materials quickly inhaled a two-way switch, stator work area, in a very narrow gap is subjected to the intense mechanical movement and fluid shear, so that materials cut, torn, broken features, and quick with the high-rise mixed homogeneous materials, and more effectively with intermittent emulsion machine, pipeline-type emulsion to complete emulsification pump , homogenization, dispersion, grinding, crushing, mixing reaction process. Hao cauldron at the end of emulsifier in the series is designed for mass production, using claw bite, double, and suction structure of the upper material is difficult to avoid inhalation of the dead and the vortex caused by the phenomenon. 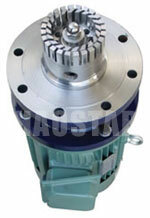 Stronger shear device, so that production efficiency and improved quality of dispersed emulsion. Hao cauldron at the end of emulsifying machine equipment is highly efficient, rapid and uniformly one-phase or multiple phase distribution to another, continuous phase, but under normal circumstances, each individual phase is insoluble. As the rotor generated by the high-speed rotary cutting speed and high-frequency mechanical effect brought about by the strong kinetic energy, so that immiscible solid phase, liquid, vapor amount in the corresponding mature technology and common role of additives in an instant even fine - dispersed emulsion, after the cycle of high-frequency end to ensure a stable high-quality products.